What could be more decadent than having your own Monza steam shower by Wasauna at home? You won't need to go travel to a spa to enjoy the ultimate in relaxation. Instead, you'll be able to enjoy an amazing spa shower experience in the privacy and convenience of your own bathroom. Your Wasauna Monza Steam Shower is fully outfitted with built in seating for two people, both of whom will be able to sit back and enjoy the exhilarating cascade of water from the overhead rain shower. You'll feel the tension wash away from your tired and aching muscles when you feel the spray from the 20 different shower jets installed around the showers. Your at home spa experience will be further enhanced with chromatherapy lighting, which includes seven variations you can enjoy, depending on your mood. Additional features include LED lights and an AM/FM radio, which you can easily operate from the unit's illuminated control panel. spa relaxation. The shower itself is silver and white. You can select the color of the rear glass panel for your unit, choosing among blue, white, or silver. The dimensions of the unit are 59x59x89. The manufacturers suggested retail price (MSRP) is $3,899. You can order online, and delivery is free within the United States. 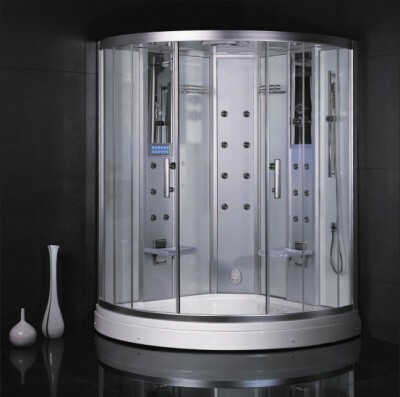 The Monza Steam Shower comes with a five year manufacturers warranty. For more information, see www.wasauna.com.